The Knights of Destruction presents the 2018 Tour of Destruction on Saturday, August 11, 2018 at Motor Mile Speedway. For the first time ever at Motor Mile Speedways, enjoy The Knights of Destruction! The Tour of Destruction is a crazy and unique twist on short track stock car racing. The show is full of alternative thrill show style races, where its less about winning and more about putting on a great show. Advance tickets are $12.00 for adults, $8.00 for kids ages 3-12 and free for kids 2 and under. To purchase tickets online, visit: https://www.tourofdestruction.com/motormilespeedwaytickets. Gates open at 5:30 pm and the show begins at 7:00 pm. This event is general admission and seats are always first come first serve. This "Tour of Destruction" show is a rain or shine event. We however do reserve the right to delay, cut, adjust or event rain date our show if we feel the safety of fans, drivers and staff is an issue. We will run the show in light to little rain showers. No outside food, coolers or alcohol permitted inside of the venue. To view the event flyer, visit: https://i.imgur.com/scuPn8l.jpg. 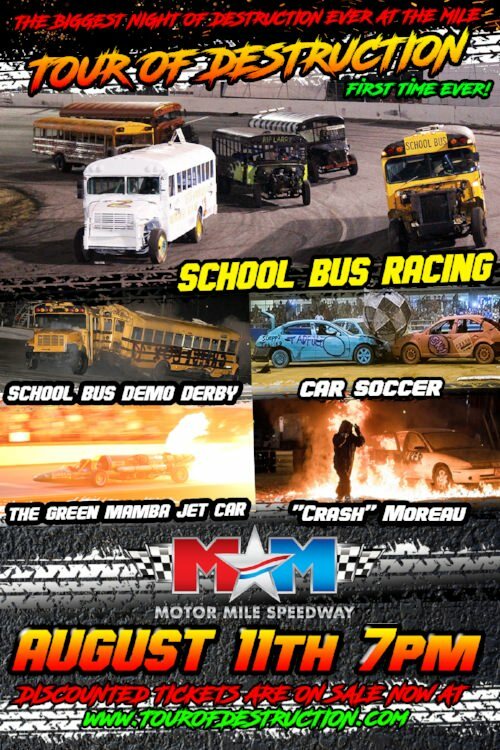 For more information, visit: http://www.motormilespeedway.com/copy-of-monster-truck-show or https://www.facebook.com/Motor-Mile-Speedway-Radford-VA-271604458727/ or call 540-639-1700.